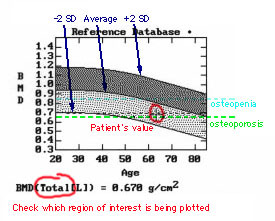 You can get a good idea about a patient's bone density in an instant by looking at the graph. The entire gray region is the 95% confidence interval for the reference range. The darker grey region represent values above average, the lighter grey below average. The WHO definition for osteopenia (-1) is shown as the dotted blue line and for osteoporosis (-2.5) as a dotted green line. DON'T read across the graph until a patient's value crosses the mean, and frighten a young patient by saying "You have the bones of a 70-year-old woman." A 30-year-old person with a low bone density still has the bones of a 30-year-old woman, but the density is lower than average. There are other changes besides density that occur with aging, and the risk of fractures for a young person is much less than for an old person with the same bone density. The graph on the Lunar reports is similar. The light blue area is the reference mean plus or minus one standard deviation. There are bars that are one SD thick that get "hotter" as they get lower.